In January-June 2018, 1.325 million foreigners and stateless persons from 189 countries visited Azerbaijan, which is 10.2 percent more than the same period in 2017, the State Border Service told on Tuesday. According to the State Statistics Committee, 30.5 percent of the arrivals were made by Russian citizens, 21.1 percent by Georgia, 11.1 percent by Iran, 10.8 percent by Turkey, 3.6 percent by the UAE, and by 2.1 percent by Iraq , 2 percent by Ukraine, 18.7 percent - citizens of other countries, 0.1 percent - stateless persons. Over,68 percent of visitors were men, 31 percent were women. Above,14 percent of foreigners and stateless persons came to Azerbaijan in January, 12.5 percent in February, 20.9 percent in March, 16.5 percent in April, 15.7 percent in May, and 20.3 percent percent in June of the current year. During the six months of this year, the greatest growth among visitors was observed from the Persian Gulf countries (with the exception of Iran). Thus, in comparison with the 1H2017, the number of Kuwaiti citizens who came to Azerbaijan increased by 5.1 times, Saudi Arabia by 3.5 times, Bahrain by 2.6 times, Qatar by 2.1 times, Oman - 1.6 times, Iraq - 44.3 times and UAE citizens - 8.8 times. The number of arrivals from Iran decreased by 18.8 percent. 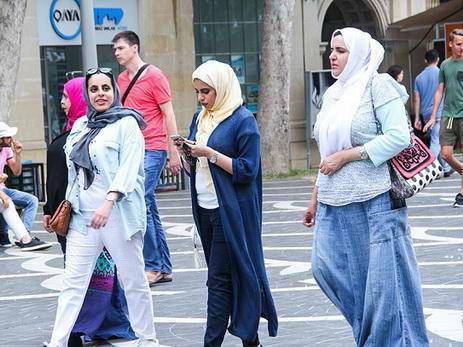 The total number of visitors from the Gulf countries increased by 4.9 percent, amounting to 276,600 people, and almost one in five tourists came from the Persian Gulf countries. The number of people who came from the EU member states in January-June 2018 increased by 6.3 percent to 53,500 people, the number of people who arrived from the CIS countries increased by 7.5 percent to 478.300 human. Over,59 percent of foreigners and stateless persons who came to Azerbaijan used rail and road transport, 39.2 percent - by air, and 0.9 percent - by sea. In the 1H2018, the number of Azerbaijani citizens who went abroad, increased by 6.3 percent. Of the total number of Azerbaijani citizens who left Azerbaijan, 30.7 percent visited Georgia, 28.7 percent - Iran, 21.2 percent - Russia, 12.7 percent - Turkey, 1.7 percent - Ukraine, UA, 3.8 percent visited other countries. Among those who went on trips abroad were 68.8 percent men, 31.2 percent women. During the reporting period, the number of Azerbaijani citizens who left for Iran increased by 22.8 percent, on the contrary, the number of those who went to Turkey decreased by 6.8 percent, Georgia - by 0.7 percent, to Russia - by 2.6 percent. Above 80 percent of Azerbaijani citizens who left for foreign countries used rail and road transport, 18.9 percent - air transportation, and 0.9 percent - sea transportation.